Antique Japanese hanging scroll attributed to Kano Chikanobu, painting of Hotei resting on his bag and holding his fan, painted with sumie ink on paper, beautiful scroll mounting and condition. 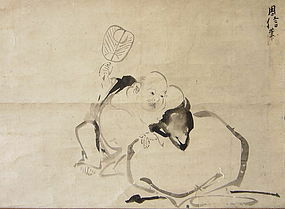 Age: Edo period (1600-1868). Size: Length: 52" Width: 22.1", with ends: 24.5". Antique Japanese round table, carved all over with irises, curving legs are in especially high relief with large iris blossoms, dark finish, table top has reddish brown finish, beautifully carved and very dramatic, made for export, circa 1910. 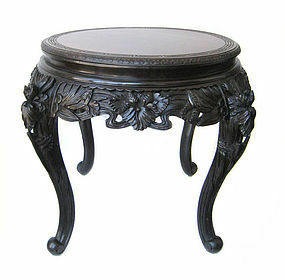 Size: 29 1/2" high x 39" wide (at widest point) Table top is 28 1/2" wide diameter. 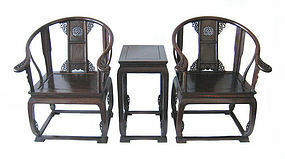 Chinese set of two oxbow chairs and rectangular stand, made of extremely heavy and dark hardwood possibly zitan, carved with filigree, mid 20th century. Size of chairs: 39" high x 30" wide x 23 1/2" deep. Size of stand: 29" high x 15 1/4" wide x 20" deep. 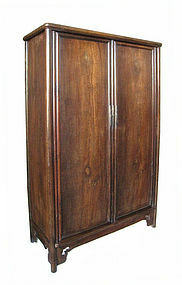 Chinese tapered A-line cabinet, made of jichimu (chicken-wing) wood, nice lines and simple elegance, interior has two shelves, lower shelf has two small built in drawer also made of jichimu wood, circa 1920's). Size: 47" high x 30 1/2" wide (at bottom) x 13" deep. 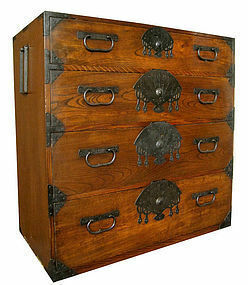 Antique Japanese isho tansu (clothing chest), 4 drawers, wonderful fan shaped lock plates with the shallower top drawer having a smaller version of the fan lock, all iron hardware, keyaki (elm) wood on drawer fronts with nice translucent lacquer finish and dramatic grain, Meiji Period. Size: 34 1/4" high x 34 1/4" wide x 19" deep. 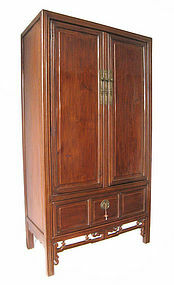 Antique Chinese tall wardrobe cabinet, made all of jumu (elm) wood with very beautiful grain, middle bar has been attached to door so that the cabinet opens with clear access to interior, inside has one shelf with two small drawers of jumu wood finished on the front to match the exterior of cabinet, bottom has one large drop in panel that locks with key, 19th century. Size: 78 1/2" high x 42 3/4" wide x 21" deep. 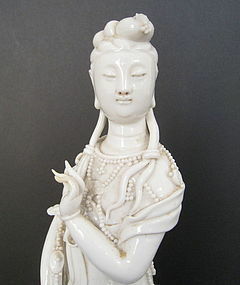 Subtle and beautiful blanc de chine statue of Kwan Yin, the goddess of mercy. Immaculate detail work on the decorations, face, and hands. Contains two seals, one seal reads, Xuande 18th century. 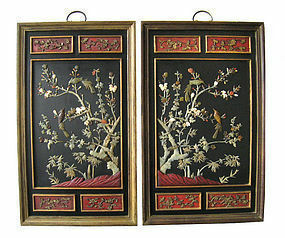 Size: Length: 3.15" Width: 2.5" Height: 9.75"
Magnificent Chinese Dali Marble framed in a carved huanghuali stand. 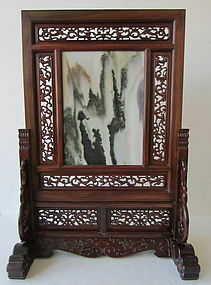 Stand is carved with dragons, scrolling clouds, and vines. 20th century. Size: Length: 21.25" Width: 11" Height. 30.18". 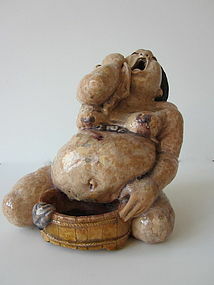 An interesting Japanese ceramic study of a woman giving birth. Black glazes with hints of green for the hair, clear glaze with blue color glaze for the washcloth. 19th century. Size: Length: 7.75" Width: 5.5" Height: 7.75".